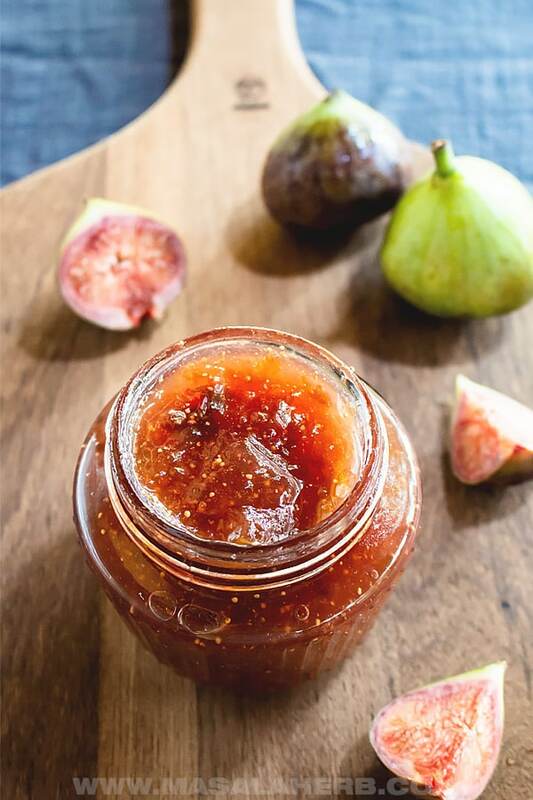 Homemade Fig Jam Recipe – Prepared, all natural, with fresh beautiful figs, without pectin, and with only 3 ingredients. This is a French jam preserve recipe. Learn how to make your own fig jam at home easily and quickly with my video and essential jam making tips below! AND get some inspiration with fig jam uses and ideas. 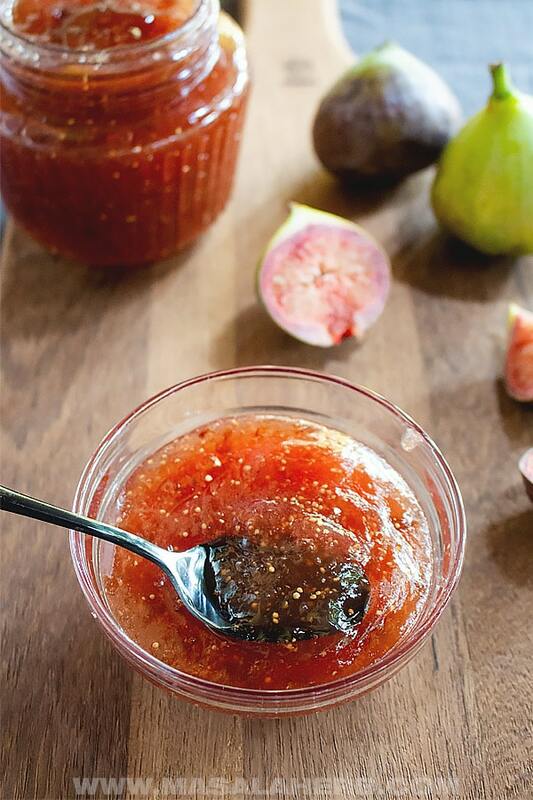 Do you like winter fruit jams like the fig jam? The authentic Orange Marmalade and vanilla flavored Pear Preserves are my favorites! Fig trees like to grow in warmer climates. In the US, that would be California and Florida. So, figs are available from July up to December. In some places in the world, figs are sold all year round. In Scandinavia, France, and Germany you can find figs in the large Grocery malls all year round. This fig jam recipe includes only 3 ingredients and is a French recipe. Followed the traditional way of preparing this fig jam properly and you will be rewarded with the real deal, quality fig jam. That means this fig jam is prepared with regular sugar and lemon juice. No artificial pectin sugar is used in this jam for various reasons. Pectin sugar has a distinctive taste and I just don’t like it. You can make out the pectin-sugar taste which overshadows the real fruit flavors that I oh so love in my homemade jams and this also the case in this fig jam. A traditional French jam preserve recipe will always use only plain regular sugar. The type of sugar that everyone has at home lying around in the pantry. 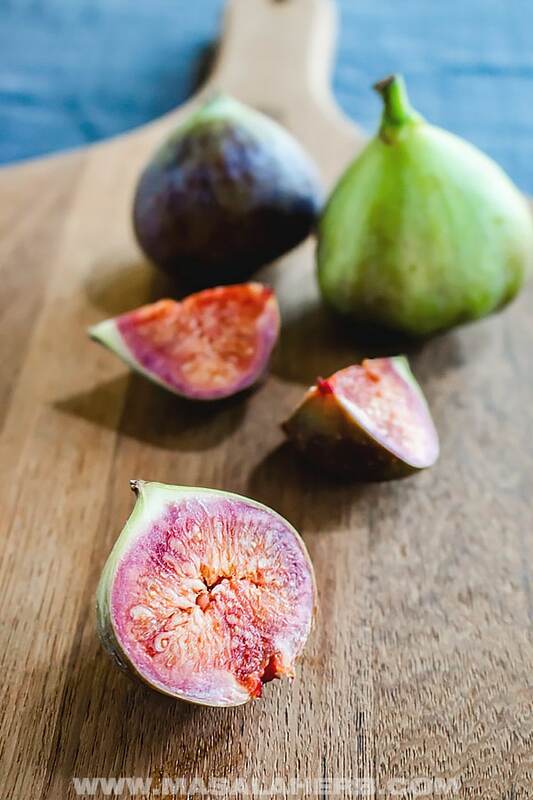 For the figs, pick fresh not too soft and a little firm sweet fruits. Don’t ever use figs that are turning bad, this would totally reduce the shelf live of your jam. It’s a big nono! Only use fresh figs. Lemon juice is added to the fig jam because figs contain less natural pectin then say apples or lingonberries. The juice of a lemon contains some pectin, the highest amount of pectin is in the skin of a lemon. I didn’t add the lemon skin here to this recipe because you would need organic pesticide-free lemons and I didn’t have that on hand. However, feel free to add in whole pieces of lemon skin to add natural pectin to your jam. Take out the skin once the jam is set. How to make Fig Jam? Why is my fig jam runny? There are a few reasons why your fig jam can turn out runny. You reduced the amount of sugar in the recipe because you thought it’s too sweet and that it contained too much sugar. The sugar is required is the major preservation agent in a jam, please don’t reduce the sugar amount. The recipe requires the exact amount of sugar to preserve the jam for the months to come. Besides, you will only use a teaspoon of jam on your breakfast bread or in your yogurt. You didn’t give your jam a rolling boil or you didn’t cook your jam long enough. The jam setting temperature is 105 Celsius/220 Fahrenheit. In that case, use a thermometer to help you get the temperature right so that your jam can set properly and doesn’t turn runny. You used a pan that wasn’t giving uniform heating. Some of the jam got cooked less some too much. I recommend that you pick a stainless steel pan or even better, a French copper jam making pan. A copper pan cooks the jam uniformly. Make sure to stir frequently too! You doubled the ingredient amounts to make a bigger batch. It’s easier to work with a batch of 1-kilogram (2 pounds) fruits, that’s why all my jam recipes call only that much fruit. Trying to jam more than a kilogram at a time can complicate things. The sugar quantity would need to be adjusted and the more fruit the longer it needs to be cooked to set. Easiest is to stick to a kilogram (2 pounds) of fruit at a time. Keep in mind this is a recipe doesn’t call for artificial pectin. This is a traditional French fig jam recipe. Artificial pectin is not added to French jams. Hence why you shouldn’t reduce the amount of sugar added to the jam. Why is my fig jam too thick and hard? The main reason why your fig jam has turned out hard is because you overcooked it, thinking it was still runny when hot or the jam was cooking on high heat. Use a thermometer to know when the jam is set and test on a freezer cold plate or spoon to check if it’s ready. If it runs it needs some more cooking. Keep in mind that jam will always appear liquid when it’s hot. It gets thicker when it cools down. That’s why the freezer cold plate comes handy, because the hot drop of jam cools down instantly and that’when you know if your jam is good to be canned. We have never cooked a jam at home with pectin, so I can’t help you with that. In fact, my french mum sells her jams in the local farmers market in Austria. What’s the setting temperature for the fig jam? The perfect setting temperature for your fig jam is 105 Celcius/220 Fahrenheit. a plate in the freezer, so that you can test if the jam is set and not runny. 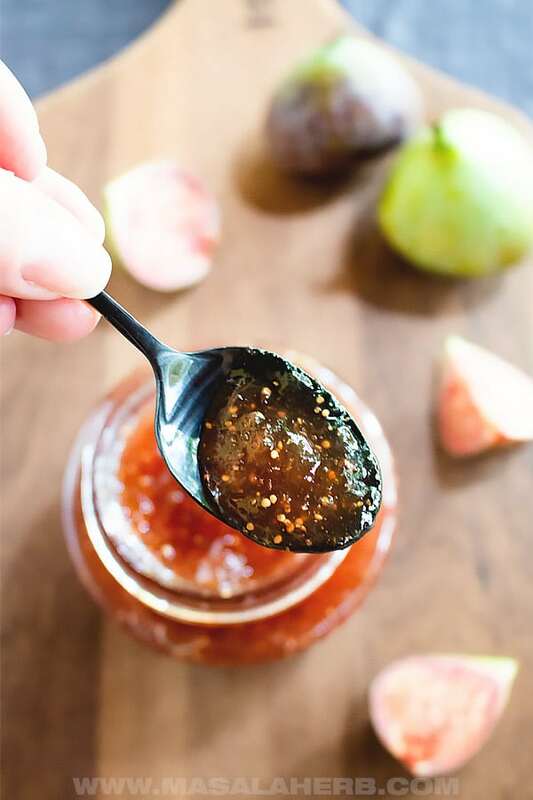 Fig Jam is versatile and tastes great not only as a breakfast spread or dessert flavor addition but also used with savory food ingredients such as cheese. 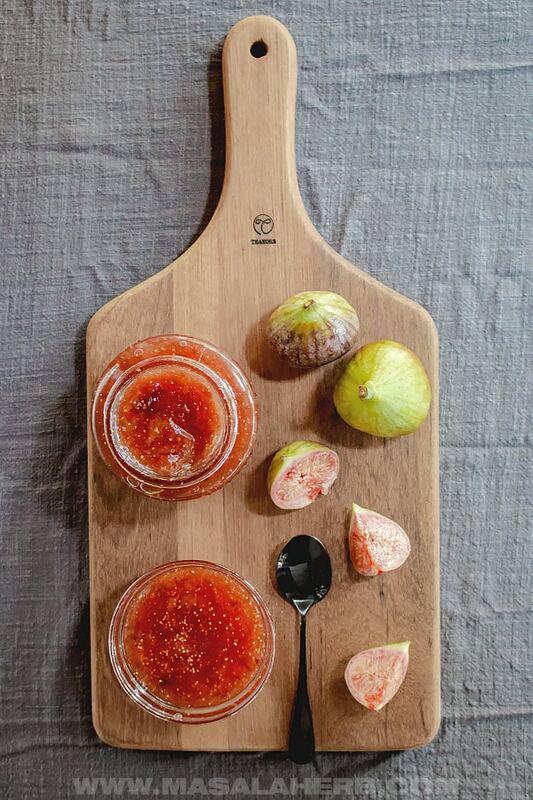 Collect some fig jam uses and ideas below! Wash your figs and pat dry. Keep a plate in the freezer (will use it later to test setting of jam). Clean and sterilize your jam jars and lids. Quarter figs and place into large jam cooking pot. Pour sugar over figs, as well as the lemon juice. Mix the fruits with the sugar and lemon juice. Keep on medium heat and bring to a rolling boil. Then reduce heat to a simmer, stir occasionally. Let the jam simmer until it's set. To test setting, either check with your thermometer, setting temperature 105 Celcius/220 Fahrenheit, and/or drop some jam on the ice cold plate and turn the plate a bit to see if the jam runs (watch my video). If it's not moving, your jam is set. Fill your clean jars with the jam up to the rim so that there is no air when you close the lid. Drop some rum or other alcohol onto the lid to kill any germs left. Wipe your jars clean, close with the lid tight and quickly turn the jam jars upside down to create a vacuum. Leave the jam jars upside down for about 24 hours. Then turn them. Keep your labels ready, mark with jam name and date. Stick on the jam jars so that you know what's in it. Store your fig jam in a cool and dry place. Once opened, store in the fridge only. 1. Read up all detailed jam making tips in the post. Dear Reader, How are you planning to use your Fig Jam? I love this fig jam! My sister had a fantastic crop of figs this year so I managed to get a few jars of jam for the winter. Your recipe works every time. Great post Helene! Hmm! seem delicious. Hope my Son love it. He is a Fan of Jams and Jellies. Do you really cook the fig skins? yep, nothing wrong with the skin if you wash it properly. Fig skins are usually eaten in general, even raw. If you really feel you need to remove the fig skin then go ahead, but it’s not necessary because the skin is so thin and fragile. Besides just cutting the fruit is faster. 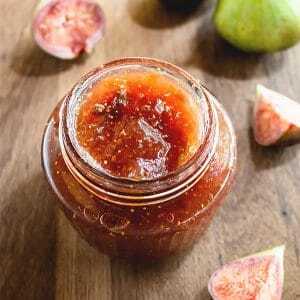 Hi, this may be interesting you: Fig Jam Recipe - How to make Fig Jam!